Image courtesy of From the FCC report on pay-TV pricing. From the FCC report on pay-TV pricing. If you just had a hunch that your basic cable pricing was going up more rapidly than the other things you pay for, you’re probably not mistaken. A new FCC report on the cost of pay-TV services says that during 2012 the cost of a basic cable TV package increased at more than four times the rate of inflation in the U.S. 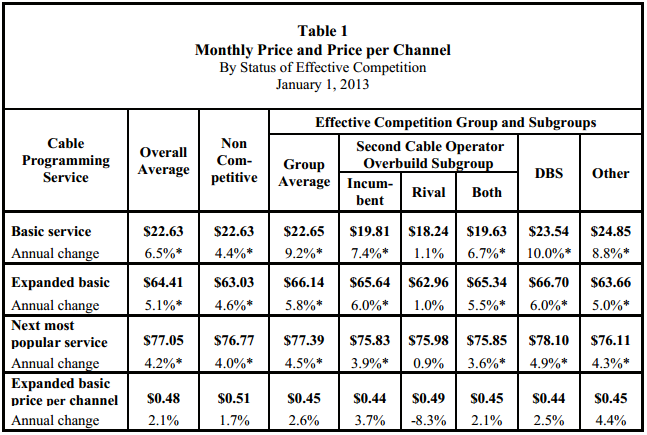 According to the report [PDF], during 2012 the average price of the most basic cable package increased by 6.5% to $22.63. Meanwhile, inflation in the U.S. that year was only 1.6%. Rates for the more popular “expanded basic” packages jumped up 5.1% to $64.41 in 2012, more than three times the rate of inflation. And this isn’t just a short-term trend. Over the 18-year period from 1995 to 2013, cable rates increased 6.1%, while the Consumer Price Index’s compound average annual rate of growth over this same time period was only 2.4%. Even more worrisome is that the rates quoted above do not include equipment charges and fees. In recent years, cable companies recently began increasing the monthly fees charged for equipment that had once been built into the monthly rate for TV service. According to the FCC’s numbers, “equipment prices for basic and expanded basic services increased by 4.4 percent and 4.2 percent, respectively” in 2012. Interestingly, the existence of “effective competition” in a market resulted in higher average prices. In markets without competition, the average price for expanded basic packages increased by 4.6% while those “effective competition communities” saw average rate hikes of 5.8%. Now, this doesn’t necessarily mean that competition drives prices up. It hinges on the FCC’s use of the very specific term “effective competition,” which only occurs when a pay-TV operator successfully petitions the FCC to declare there is competition in a certain market. If a market is determined to be effectively competitive, the cable operators are no longer restricted by local pricing regulations. 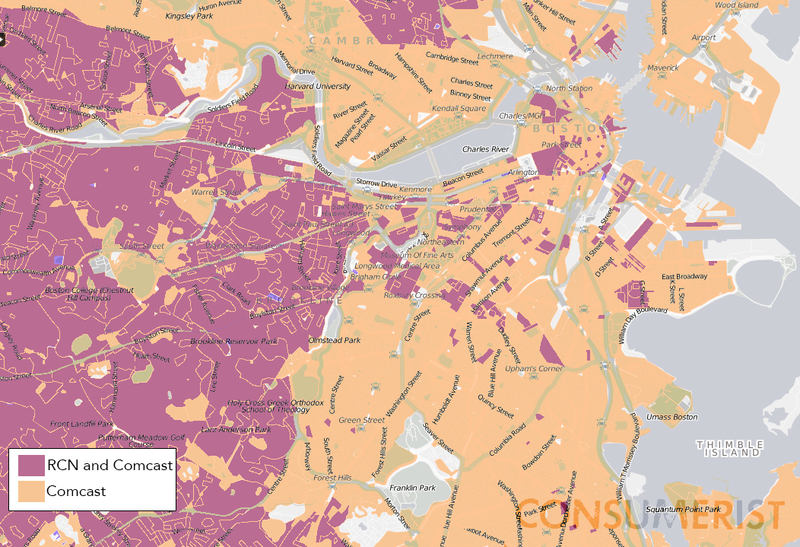 Let’s look at the example of Boston, where Comcast had convinced the FCC in the early part of the 21st century that the minor presence of RCN in the area made the market effectively competitive, meaning Comcast no longer had to follow Boston’s cable pricing rules. Additionally, satellite service can count as competition. While comparing a terrestrial cable company to a satellite provider may have been an apples-to-apples comparison in 2000, it is not in 2014, as cable operators generally offer broadband Internet access that satellite operators have generally been unable to match in terms of speed and reliability.